I have had these a million times at parties, but never knew how easy they were to make. Literally 4 ingredients, a double boiler and wax paper and you can make dozens of these delicious holiday treats in NO TIME! These are great to make with the kiddos! 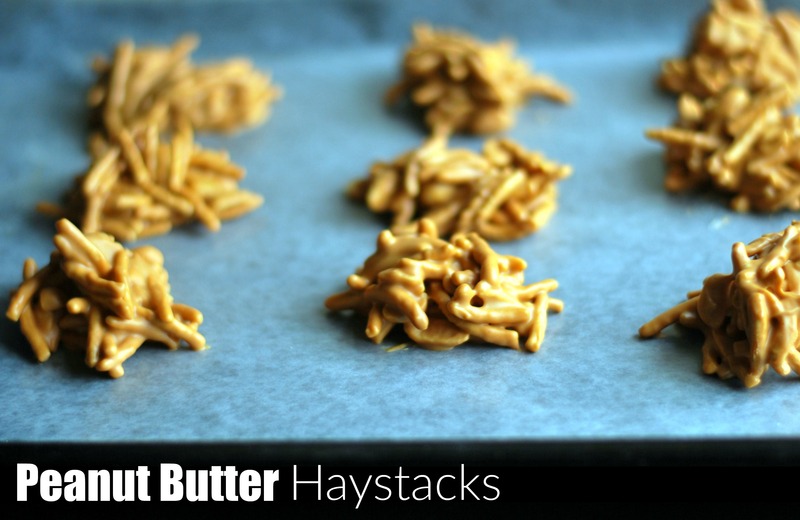 Melt butterscotch chips and peanut butter on top of a double boiler until smooth. Stir in peanuts and noodles gently until combined. Drop in forkfuls on wax paper. Cool for 20 minutes or until set. (I had to put mine in the fridge for a little while to get mine to set which was no big deal!) Enjoy! omg!!! these bring back memories. These sound really odd but they are really quite tasty. this was one of the first recipes i ever made in my 7th grade home-ec class (remember those?) waaaay in 1966! i don’t think we added the peanuts but the peanut butter/butterscotch combo with the crispy chow mein noodles are delish…. If you are making cookies trays dont put these in the tray, just put them in a small cookie bag and put them on top. because if put them with other cookies they will all have the butterscotch taste.